We embrace your little ones’ curiosity and nurture their innate personality. Our Transitional Two’s Toddler Preschool Program in Rockville is designed with early preschool age (two- and three-year-old) children in mind. Songs, stories, simplified Montessori materials, and a gentler pace foster the natural curiosity that toddlers possess. This is a two-year-old preschool your child will love! Through love, patience, and understanding, our toddler and early preschool program creates a home away from home for your child. Using Maria Montessori’s philosophy towards learning, Norbeck Montessori creates an academic environment in which your child will develop a true love for learning. Interested in enrolling in our Transitional Two’s program? Schedule a tour of our Montessori preschool classroom in Rockville today! Our toddlers truly love their school environment at Norbeck Montessori! Everything in our Transitional Two’s early preschool classrooms is tailored for little hands and bodies, from small chairs in reading nooks to low shelves designed with spry two-year-olds in mind. In this fun and dynamic environment, Norbeck Montessori’s two- and three-year-old preschool program focuses on developing an independent, caring child who has a strong foundation in the Montessori way of teaching. Our toddler rooms are well lit and fully equipped with areas for both group and individual activities. 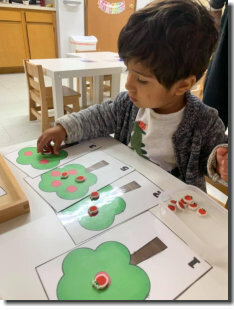 When visiting our early preschool classroom, you may see the class in a small group with a teacher learning sounds, colors, numbers or shapes. 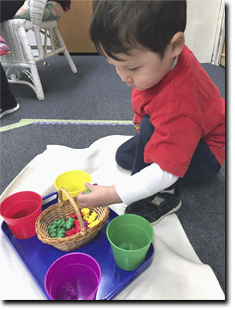 Or, you may see children sitting by themselves using tongs or tweezers to sort objects by color, working on their fine motor skills and hand-eye coordination. 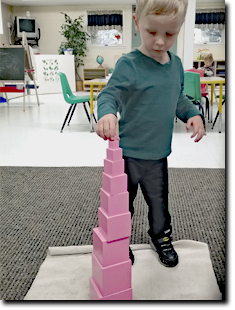 No matter what fun activity they’re doing, all lessons and materials fill a specific need for your toddler’s growth. Not only does our early preschool curriculum encourage a life-long love of learning, but it enhances large and fine motor development and refines hand-eye coordination. Not sure if your child is ready for preschool? Call Norbeck Montessori at 301-363-7009 today for an in-depth overview of our Montessori preschool programs. Snack time and circle time are terrific opportunities for your preschool child to practice manners and courtesy. Sitting quietly and listening to a story, helping their friend clean up when they have a spill, and many other skills are practiced daily as we prepare your child for the next stage of their Montessori journey—the Primary classroom. Learn more about the Montessori Curriculum today! At Norbeck Montessori, we believe that clear communication with parents is essential to the child’s well-being. It is particularly important during the early preschool years when children reach and surpass many developmental milestones. Our preschool teachers keep a daily log of your child’s basic activities, which we share with you on a regular basis so that you are informed and confident that you know how your child is progressing. 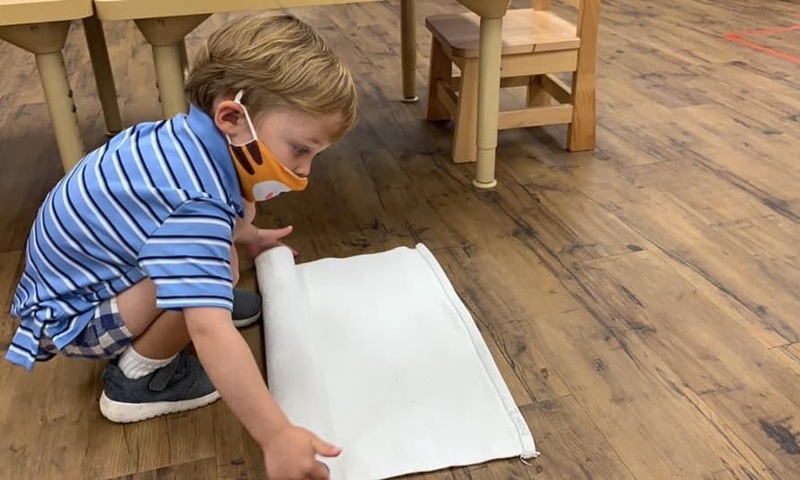 We understand how valuable regular communication is at the preschool age, so we’re happy to take these extra steps. Come see how much fun toddlers are having at Norbeck Montessori! 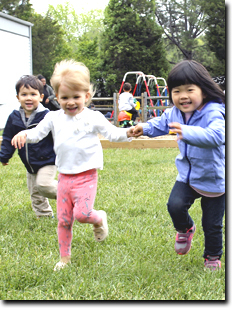 Schedule a tour of our Rockville preschool today!